The Invention of the Brahmi Script. 11-13, January 1978, pp. 47-50. The antiquity of writing in India stretches back to the Indus valley civilization a civilization which lasted for almost a thousand years from 2500 to 1600 B.C. Excavations conducted during the last few decades have shown that this civilization was spread over a vast region extending from West Punjab in Pakistan to East Punjab, Rajasthan, Uttar Pradesh and Saurashtra. The excavations have brought to light a number of seals with a variety of signs. There are signs that resemble the crab, the fish, the arrow, the wheel and other natural and man-made objects. Different international groups from Russia, Finland and India are using computer-assisted methods in attempts to decipher the Indus script. However, no generally acceptable solution has been found so far. With the disappearance of the Indus civilization around the middle of the second millennium B.C., there is a gap of over a thousand years before we come across inscriptions again. And these inscriptions belong to the reign of the emperor Asoka (in the 3rd century B.C.). Though the majority of Asoka's inscriptions were written in the Prakrit language, there were a few in Greek and in Aramaic, the language used in Palestine. The most common script used in Asokan inscriptions was Brahmi. In addition, the Kharosthi, Greek, and Aramaic alphabets were used. It should be noted that all of these scripts are alphabetic, but that the Indus script is not. A slightly different variety of Brahmi was used in the Madurai region from the 3rd century B.C. 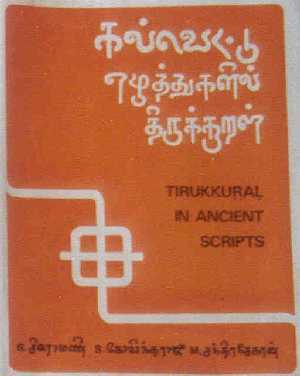 to write Tamil inscriptions. In Sri Lanka, Brahmi was also used from the 3rd century B.C. but the language was Prakrit. The letters of Brahmi are simple, easy to read and write. The system of medial vowel sign adding vowel signs to consonants is easy to follow. It envisages the addition of short vertical or horizontal strokes in well-demarcated areas to represent the i, e, u and long a and o sounds. 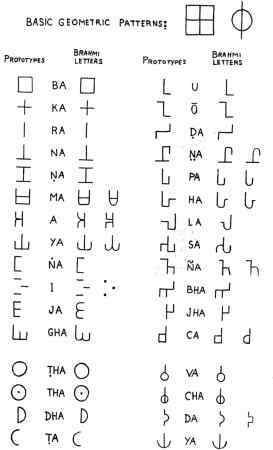 Scholars have traced the development of all the various alphabets in India from the 3rd century B.C. Brahmi in one continuous evolution of multiple forms from the single parent stock. Here we wish to claim that the Brahmi script was invented at one stroke possibly by one individual. This means that we reject both the theory that it was evolved from the Indus script and also the theory that it was borrowed and developed from some non-Indian script. The square, the cross, the circle, and the vertical line are all examples of letters of the Brahmi alphabet extracted from the two basic geometric patterns. Some other letters which may seem anomalous, do have forms found in Sri Lanka which are angular, and these angular forms are close to our model of the cross inscribed in a square. Some letters such as ca can be derived either from the square pattern or from the circular pattern. Over a period of time, the angularity of most of the letters has been replaced by circular or cursive forms. In Asokan Brahmi there are no pure consonants as in English, for example, k or n, to mention only two. The corresponding letters in Brahmi stand for ka and na, where the vowel a (short) is inherent in the consonant letter. To lengthen the vowel a or add the other vowels, separate horizontal and/or vertical strokes are attached to the basic letters. The letters of the Brahmi alphabet have been carefully designed so that they avoid any ambiguity that might arise due to the addition to them of the vowel marks. This well thought out system is another indication that Brahmi was an invention. There is a symbol for the initial vowel i (short or long) which has two forms. One form is made of three dots; and in another form the three dots are represented by three horizontal strokes. It might seem difficult to believe that this symbol of three horizontal strokes has anything in common with the other letters of the Brahmi alphabet. However, we find that it can be directly derived from our basic geometric square pattern. This derivation provides additional support to our claim. From the square model we derive letters containing line segments that meet at right angles. However, there are a few letters of the Brahmi alphabet that have line segments that meet at an acute angle of about sixty degrees. There are two ways of accommodating such signs in our system. One way is to postulate a third basic geometric pattern with a triangle attached to a vertical line. Another more consistent way is to look for variants of the letters in which the angle is closer to a right angle. We do find such variants, and perhaps these variants which fit into the square and cross pattern represent the original prototypes. FROM TWO BASIC GEOMETRICAL PATTERNS.